Dragons, unicorns, fairies, zombies… and Santa? At the center of it all, stands Dee, a man immortalized in legend as Decompose. An ongoing war between unicorns and dragons has led to the creation of a plague… a deadly infection Dee is the host for. Not quite human, but not a unicorn either, he and the plague form a symbiotic relationship, resulting in immortality, of the undead kind. Every ruling Empire has desired control of Decompose. Controlling the infection equals control of the people. An intervention of an old rival, Santa, who is an alien of course, results in Dee going missing. When he resurfaces decades later, Dee has one goal: locate the mythical cure to his plague. 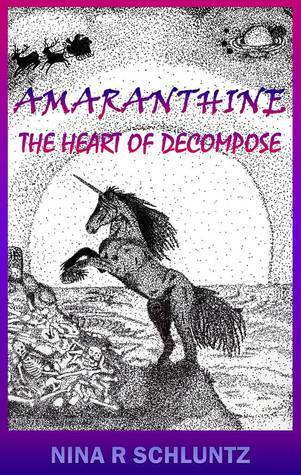 Complications of the heart, force Dee to decide if he truly wants to find the cure and give up being Decompose. I still remain a sucker for a good story that has zombies in it. I fell for the zombie craze long ago and it's still holding strong. I loved this take on zombies, it was different maybe because they were alien zombies. Dee is the creator of the infection that created zombies. After he realized what he had done he tried to fix it by creating a cure and placing the cure in his friend Jhon. After an accident with Jhon and a dragon eating Dee...let's just say things didn't go as planned. It's fifteen years later and Dee is back to trying to find Jhon to cure the disease that he created. This was such an interesting book. Like I said I loved this take on zombies, you never really hear about the creator of the disease in books. Usually characters are just trying to survive but not The Great Decompose (Dee) he is searching for the cure. I really liked Dee, I don't even care that he was the one responsible for creating the zombies in the first place. He was a strong and unique character. As interesting as the plot was I still got lost and confused at times. Some chapters I found kind of boring and unnecessary. Once I got passed those chapters though it managed to hold my attention pretty well. I like Harmony and Dee's relationship, I just wished they would have made her older than fifteen. Dee's age is never told because he was immortal so in other words there is no telling his actual age but it's a lot older than fifteen. He said he would wait the three years for her to turn eighteen but I think the story would have been better if she was already eighteen or older. And it wouldn't have seemed so gross and wrong. Putting the large age difference aside I still liked them together. I didn't really care for Jimmy. He was selfish throughout the entire book and never really seemed to care for Dee. Other than what Dee could do for him; there were times he acted like his friend but then he would take a few steps back. After the dragon battle towards the end of the book it got really depressing. I felt bad for Dee and felt worse that no one understood what he was going through. I was getting upset because I thought it was going to end in that sad, depressed nature but thankfully it didn't. It had a cute and happy ending like all good books should.